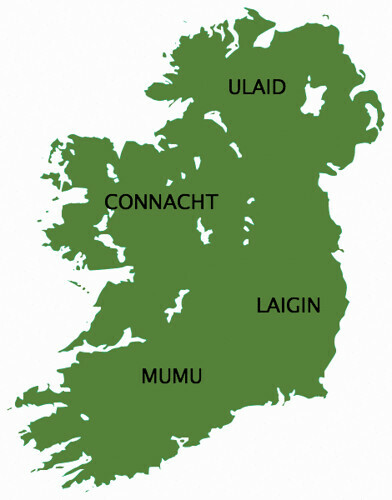 As we will see, the evidence suggests that each province had an overarching goddess of sovereignty, from which many claimed descent from: In Ulster, the main goddess we find is Macha; in Leinster, there is Brigit; in Munster there is Anu; while in Connacht (and Meath) there is Medb. Within these areas, distinct dynasties rose and fell over the centuries, and we can often see from the genealogies and toponymics that these families had their own ancestral deities and sovereignty goddesses. It is often said that ancestor worship was (and still is) prevalent in Celtic cultures, as it has been throughout the Indo-European cultures. We can see from the archaeological evidence that generations and generations of people were often buried in the same burial mounds, Iron Age remains being interred in the same area as their prehistoric ancestors. The inference is that it was believed that ancestors remained important long after their death, perhaps being seen as welcoming the more recently deceased into the afterlife. Certainly it was important to know where you came from – the pedigree of your ancestors, the names of the people who came before you – affected the status and political standing of you and your offspring in the present. It is natural, then, in this respect, to see that one’s own ancestors are worthy of veneration; after all, we wouldn’t be here today without them. Looking at the evidence, however, we see another reason being suggested; often, families traced their genealogical pedigrees back to the gods themselves. Most of the surviving genealogies date to the twelfth century, but some of the earliest (of the Laigin) date as far back as the seventh century.5 Many of these genealogies bear the marks of careful editing, with many families tracing their ancestry back to Éremón, one of the sons of Míl, and through him, back to Noah – all firmly and neatly in line with the Bible and the Lebor Gabála Érenn. Otherwise, members of the Tuatha Dé Danann pop up here and there, giving their name to certain dynastic septs – such as the Uí Méith Macha, who are connected with the ecclesiastical establishment of Armagh (Ard Macha) from as early as the sixth century.8 Given Macha’s close ties with the area, it’s tempting to see their name as linking themselves directly with a divine ancestry. In Munster, the Eoganacht traced their descent back to Míl’s son Eber, through Áine, her father Fer Í (‘man of yew’ – hinting at a reference to a bile, sacred tree), his father Eógabal, and so on back to Eber. Sometimes Áine is listed as the daughter of Manannán mac Lir, however.12 Yews figure elsewhere in the origin legends of the Eoganacht, with Conall Corc’s founding of Cashel – the royal seat of Munster – being prompted by a vision of seeing it built on a rock where a yew grows out of it.13 The main religious foundation of the Eoganacht, at Emly (Imleach Ibar) in County Limerick, also gets its name from a word for yew (ibar).14 All of this suggests a long established pedigree going back to a sovereignty goddess that has been tweaked into a more acceptably Christian, although still thoroughly Irish, framework. Contrary to the claim of the Lebor Gabála Érenn, however, Nuadu does get a mention in the Eoganacht genealogies, albeit indirectly. Those who traced their descent through the founder of Cashel, Conall Corc (c400C.E.) have Mug Nuadat as a distant ancestor; the name means ‘servant of Nuadu’,15 suggesting that Mug Nuadat – also known as Éogan Taídlech, or Éogan Fitheccach – was a devotee of Nuadu.16 In the myths, Nuadu is often shown as a good king – so beloved, in fact, that the leeches of the Tuatha Dé Danann fashioned him a new hand, first of silver, and then of flesh and blood, so that he could reclaim his seat.17 It makes sense, in this respect, for kings to associate (and perhaps even devote) themselves with such a paragon of kingly virtue. Áine is said to have been raped by the Munster king Ailill Olum, but later tradition has her popping up again in the fourteenth century, giving a good Irish pedigree to the Anglo-Norman Fitzgerald family after having a passionate affair with the third Earl of Desmond.19 Again, genealogy is seen to be used for political gain. Ronan, it seems, had two fathers, perhaps in attempt at boosting his pedigree, like the legendary Cruithin king Mongán (whose father was also Manannán, according to Immram Brain, for one). Or else perhaps we might see it in a comparable way to that of Cú Chulainn, who is said to have had both a mortal father – Sualtaim – and a divine father, Lug. ULAID Macha Sovereignty goddess of the Ulaid. Dál Riata Dáire Claiming descent from Dáire through the Corcu Loígde of Munster. Dál Fiatach Dáire As the Dál Riata, claiming descent from Dáire through the Corcu Loígde of Munster. Uí Méith Macha Macha Associated with the ecclesiastical foundation of Armagh (Ard Macha) from the sixth century onwards. Uí Brigte Brigit As suggested by the name. Bairrche Brigit The association may be a little shaky here; the name is thought to derive from Brigit, though the linguistic basis is questionable. Benntraige Lug Claiming descent to ‘Lug son of Ethnenn’ (an incorrect male rendering of the matronymic, Ethne – Lug’s mother) through Benta, son of Mál. Uí Liathain/Corcu Loígde Dáire, Buí Tracing their descent from Dáire, and encompassing the Beara Peninsula. Corcu Duibne Dáire Also tracing descent to Dáire. Duibne appears to derive from/relate to the name Dovinia, found on an ogam stone. Byrne claims the name is connected to Buí. O’ Carrolls Úna Trace their ancestry to Úna, who appears to be the sovereignty goddess for the area. CONNACHT Medb All of the tribes of Connaught traced descent to Medb and Fergus mac Roic. Delbnae Nuadat (Nódot) Nuadu As suggested by the name. Conmaicne Oirbsen, Medb One sept traces descent to Oirbsen (often given as an alternative name for Manannán mac Lir); all of the Conmaicne trace descent, ultimately, to Medb. 1 Bergin, Ériu 9, p118. 2 Rees and Rees, Celtic Heritage, 1961, p118. 3 Please note that under the terms and conditions of use as detailed on the Wikimedia, this image is under a Creative Commons Attribution-Share Alike licence, and may be shared or altered, with attribution and the same or similar licensing to the original image. 4 Byrne, Irish Kings and High-Kings, 2001, p11; Koch, Encyclopedia of Celtic Culture, 2006, p798-799. 5 Koch, Encyclopedia of Celtic Culture, 2006, p798-799. 6 Koch, Encyclopedia of Celtic Culture, 2006, p798. 7 Macalister, Lebor Gabála Érenn Book V, 1956, p27. 8 Dooley and Roe, Tales of the Elders of Ireland, 1999, p239. 9 Knox, ‘The Early Tribes of Connaught,’ JRSAI Vol 30, 1900, p348. 10 Byrne, Irish Kings and High-Kings, 2001, p237. 11 Ó Muraíle, ‘Some Connacht Population-Groups,’ in Seanchas: Studies in Early and Medieval Archaeology, History and Literature in Honour of Francis John Byrne, 2000, p176. 12 O’ Rahilly, Early Irish History and Mythology, 1946, p288. 13 Dillon, ‘The Story of the Finding of Cashel,’ in Ériu 16, 1952, p63. 14 Koch, Encyclopedia of Celtic Culture, 2006, p705. 15 O’ Rahilly, Early Irish History and Mythology, 1946, p191. 16 Byrne, Irish Kings and High-Kings, 2001, p291; Koch, Encyclopedia of Celtic Culture, 2006, p705. 17 Cath Maige Tuired, 33 onwards. Note also the cosmogonic elements of the refashioning of Nuadu’s arm. 18 Koch, Encyclopedia of Celtic Culture, 2006, p705. 19 Lysaght, The Banshee: The Irish Supernatural Death Messenger, 1986, p195. 20 Dobbs, ‘The History of the Descendants of Ir,’ in Zeitschrift für celtische Philologie Vol 13, 1921. 21 Ó hÓgain, The Lore of Ireland: An Encyclopedia of Myth, Legend and Romance, 2006, p486. 22 O’ Rahilly, Early Irish History and Mythology, 1946, p48. 23 Byrne, Irish Kings and High-Kings, 2001, p166-167. 24 O’ Rahilly, Early Irish History and Mythology, 1946, p38. 25 Koch, Encyclopedia of Celtic Culture, 2006, p1079. 26 Koch, Encyclopedia of Celtic Culture, 2006, p284. 27 Koch, Encyclopedia of Celtic Culture, 2006, p287-288. 28 Please note that under the terms and conditions of use as detailed on the Wikimedia, this image is under a Creative Commons Attribution-Share Alike licence, and may be shared or altered, with attribution and the same or similar licensing to the original image. 29 MacNeill, The Festival of Lughnasa, 1962, p151; Ó hÓgaín, The Lore of Ireland: An Encyclopedia of Myth, Legend and Romance, 2006, p8. 30 Logan, The Old Gods: The Facts about Irish Fairies, 1981, p34-35. 31 Stokes, ‘Coir Anmann,’ in Irische Texte III, 1897, p289. 32 Squire, Celtic Myth and Legend, 1905, p75.